I’m an old jaded observer of Romanian politics, having spent years lambasting this country’s buffoons as they were investigated for corruption and bribe-taking, demonstrated mindbogglingly bad levels of mismanagement, passed stupid and barbaric laws, engaged in superstitious and juvenile behavior, acted like they were hysterical stars in a telenovela drama, mangled the English language, let people die due to their Communist-era mentality and otherwise proved to the world on a daily basis just what a bunch of incompetent fucks they really are. Jumping the shark is an idiom created by Jon Hein that was used to describe the moment in the evolution of a television show when it begins a decline in quality, which is usually a particular scene, episode, or aspect of a show in which the writers use some type of “gimmick” in an attempt to keep viewers’ interest. Last weekend, Romanian president Traian Basescu, who now appears on television six days a week as his 10-year term in office comes to an end, made one of his trademark off-hand remarks against his political opponents, this time vilifying the husband of Gabriela Firea. Ms. Firea is now officially a senator in the Romanian parliament but for years she was a “journalist” for the Antena media group, controlled and operated by the (multiply) convicted criminal Dan Voiculescu, who has been outed as a known collaborator with the Securitate. Ms. Firea has only recently become a politician, and nearly fell out of favor a few months ago when she resigned from Ponta’s ruling PSD party after a scandal, only to be encouraged to “un-resign” by Mr. Ponta himself. Ms. Firea’s husband is the mayor of a tiny village that he rules like a medieval chieftain, which is what President Basescu was alluding to in last weekend’s remarks. But Ms. Firea is currently a member of a parliamentary commission (alternatively called either the “Nana” or “Calarasi” commission) that has been formed solely to investigate whether Ioana Basescu, the president’s daughter, legally borrowed money from a government bank in order to purchase some agricultural land in Romania from an Italian citizen who resides in Monaco. Ponta jumped on Basescu’s backhanded slur against Firea’s husband, saying it constituted a criminal threat against Ms. Firea, and threatened to file criminal charges against President Basescu, saying that Basescu would be going to jail for his “threats”. Surprising everyone, a few days later Ms. Firea did indeed file the criminal complaint, one that was co-signed by every single member of the PSD. Ponta then went on to say that the president is a “gangster” and was threatening everyone, saying that even he (Ponta) did not feel safe and so he needed to move his office to a Defense Ministry building. Again, to everyone’s surprise, Ponta actually did pick up his papers and transfer his staff to a MoD building, saying it was the only way to “escape harassment” from Basescu. Of course the Romanian constitution protects all sitting presidents (and other high-ranking politics) from prosecution for most crimes but does offer legal remedies for certain egregious violations. The standard method for removing a president from office is with a parliamentary vote to suspend him (or her) and then hold a nationwide referendum on whether he (or she) should be retained in office. But Ponta’s gang has already tried this once in 2012 (and many of his allies also did it in 2009) and failed, and anyway everyone knows Basescu will be gone for good after November, so the whole thing makes no sense from a legal perspective. Still though, all of this ridiculous theater made a little sense, as Ponta and his gang were effectively promising voters that once Basescu is an ordinary citizen, they will prosecute him for something and then cheer once he’s behind bars. Even though “negative” campaigns like this can backfire, here in Romania there are certainly more than a few voters who will support anyone who would promise to put Basescu “in his place”. But what’s with the whole hiding in an MoD building? How in the world can Ponta running and hiding serve his own political interests? After all, if David Cameron (British PM), Angela Merkel (German chancellor) or Francois Holland (French president) went and hid in a Ministry of Defense building to escape “harassment” from their political opponents, they’d be the laughingstock of the entire country. But to understand Romania you must understand the longest-running trope of them all, which is that in this country, the victim is always the hero. Every single citizen of this country is convinced that they are the victim of someone else’s evil capriciousness, and when another person can’t be blamed then it’s the work of the Devil. So while such a move wouldn’t work anywhere else, Ponta crying about how the “gangster” president was persecuting him and forcing him to find more “secure” quarters will garner sympathy from a large segment of the population. All of the above was enough to make me realize that I’m now effectively out of a job as a satirist but today Ponta went ahead and jumped the shark for realzies. On May 1, 2003, President Bush landed on the aircraft carrier USS Abraham Lincoln aboard an S-3B Viking jet, emerged from the aircraft in full flight gear, and proceeded to “press flesh,” as The Washington Post put it, as he shook hands and hugged crew members in front of the cameras. That’s right. Officially the entire world was told that the Iraq war was over eleven years ago, something that seems like a bad fiction novel here in 2014. America’s grinning monkey at the time, George Bush, who had the same tendency to walk around with an idiotic smile on his face that Victor Ponta does, strutted around in a pilot’s outfit in front of the TV cameras so that he could look tough. Just as with Bush, Ponta also did not do anything to help fly the plane, instead letting American soldiers do all the hard work. 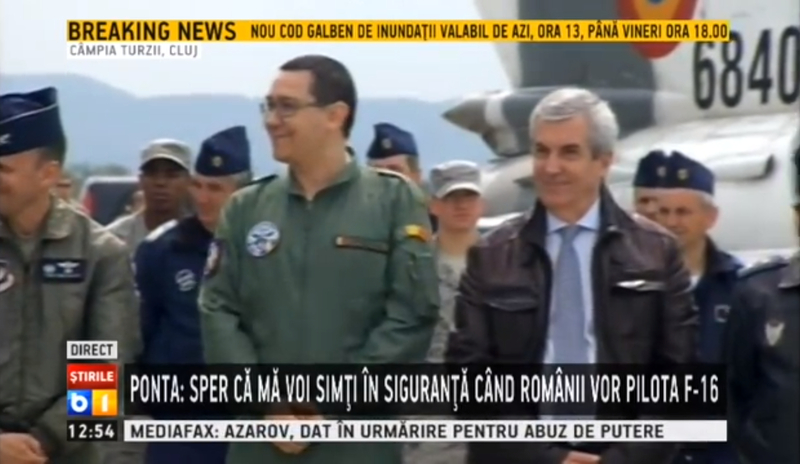 Meanwhile over in the Republic of Moldova today, a gaggle of American senators, including John “I crashed 3 fighter planes myself” McCain, Ron “I helped overthrow Yanukovich” Johnson, John “America can make a shitload of money from the chaos in Ukraine” Barrasso and John Hoeven have all landed to stir up tensions as all kinds of clashes are erupting in the eastern half of Ukraine as the country inches towards civil war. Has Ponta even mentioned this? Or Basescu? Or has any prominent politician in Romania even bothered to focus their attention on these and other extremely important global matters? Of course not. They’re all too busy strapping on the skis so that they can out-do each other by jumping over ever more ridiculous fake sharks, putting me out of a job and turning every rational citizen in this country completely off of politics entirely. all the characters…mistype sorry etc. it’s not even a bad movie, it’s a very bad cartoon… “disney from hell” … al the characters are being grotesque. Ponta jumping over fake sharks? Who needs politics with that kind of entertainment!